Want to reach boomer grandparents? To learn about how you can open the gateway to the GRANDparent economy just email ccrosby@grandmagazine.com or you may call 727-327-9039. My grandmother meant the world to me. She took me in for a while after my parents separated, and gave me an allowance that we kept under wraps. She provided guidance when I needed it, and shared family secrets my parents either weren’t privy to or were unwilling to divulge. She was the anchor to my first 27 years of life, and nearly a quarter of a century after her passing, I still feel the depth of the bond we shared and the indelible imprint she left on me. As fortunate as I was to have this special relationship, I find myself envious of today’s grandchildren. They have the opportunity to share an even deeper bond with their grandparents, and smart marketers will leverage that bond in ways that benefit not only their brands, but also grandparents, their adult children, and grandchildren. Numbering 75 million, and project to reach million in 10 years’ time, today’s boomer grandparent market is estimated to spend up to $50 billion annually on their grandchildren, according to various sources. Impacting their purchase decisions requires understanding the indispensable role they play in their families’ lives, and then using that knowledge to craft products and messages that celebrate, support and enhance that role, as well as the bond they share with their grandchildren. 1. Grandparents rely on their role as a source of happiness at age 50+. Among the top activities, people age 50 and over-identify as contributing to their happiness at this stage of their lives are “watching your children and grandchildren succeed,” “spending time with family” and “participating in family traditions” — all of which the grandparent role makes possible. 2. Parents rely on the invaluable safety net provided by today’s grandparents. Being strapped for both time and money, today’s parents welcome all the support they can get from their children’s grandparents. In fact, 15% of grandparents are raising grandchildren themselves, and among those who are not primary caregivers, one in three provides daily daycare services for their grandchildren. And, it’s not a short-term arrangement. Among those providing daily care, one-third have been doing so for at least five years, and one-third expect to do so for at least five more years. 3. Grandchildren rely on grandparents’ participation in their lives. A majority of grandchildren talk to their grandparents every week, 92% by phone and 39% online. No doubt there is the eevery day catching up talk, but neither side is shying away from the more serious issues today’s kids face—78% of grandparents discuss morals and values with their grandchildren, and a majority cover issues such as peer pressure and drug and alcohol use. It doesn’t end there. 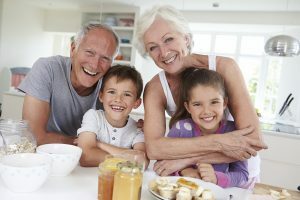 Grandparents are proactively looking to meet grandchildren on their own terms, wanting to learn more about activities that will be fun to do together; how to best connect with grandchildren; and how to talk about issues that are important to their grandchildren. 4. Grandparents take their role seriously. Eighty-nine percent of grandparents say they play a pivotal role in their grandchildren’s lives, and this comes as no surprise. Grandparents are so involved in their grandchildren’s lives that their role often mimics that of a parent. Not only are they providing care and money, but they consider it their responsibility to teach values (80%), take grandchildren to cultural events (72%), teach religion and spirituality (67%), and tell the family history (66%). 5. Grandfathers are as important as grandmothers. Grandfathers are as likely as grandmothers to provide daycare for their grandchildren, and they are more likely to spoil them, as evidenced by their favorite activities to do together—watching TV, playing physical games and going on outings. 6. Grandparents control brand choices for up to three generations. Nine in ten grandparents enjoy spending money on grandchildren, and not just for birthdays and holidays. A majority also spend on both recreational and educational expenses, and a quarter foot the bill for medical and dental expenses. But here’s the kicker: Nearly four in ten are paying for daily living expenses—that amounts to roughly 28 million grandparents making everyday brand choices for grandchildren and by extension their parents when it comes to items like food and other CPGs. Given that 54% of grandparents take their grandchildren shopping, there’s an opportunity to develop positive brand impressions at a very young age by associating a brand with one of the most important relationships grandchildren will ever have. 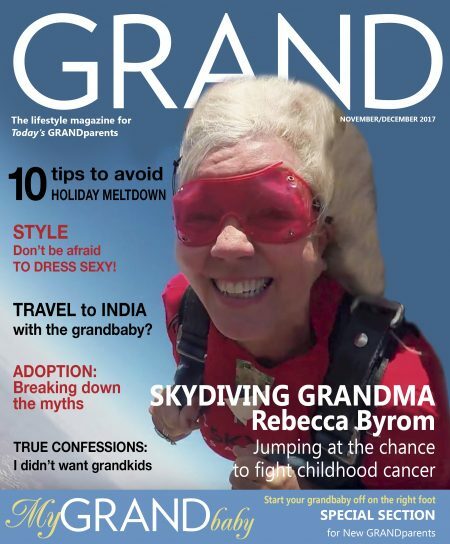 In today’s evolving American family landscape, the role of grandparent has emerged as a critical one that provides meaning, relevance and joy to the lives of grandparents; a sense of security and support for parents; and a source of wisdom, comfort and camaraderie for grandchildren. It’s a big job that grandparents have embraced and invested in, both financially and with their time. There’s an opportunity here for brands to give back to consumers in a most meaningful way—by supporting their efforts—and at the same time earn their business. It’s a win-win where, truly, everyone benefits. P.S. This one is for you, Nana.